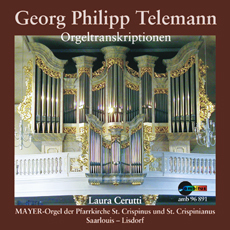 The arrangements (by the interpreter) on this CD are orchestral pieces suited to the sound of the pomp and splendour of the organ while simultaneously highlighting Telemann’s greatness. There is a bid to substitute orchestral colour with a tonally exciting organ registration, made possible by the particular tonal diversity of the organ. Saarlouis Lisdorf, not far from the French boarder, is home to the great MAYER organ (1987) of the parish church of St. Crispinus and St. Crispinianus. The organ has 43 registers distributed over 3 manuals and pedal section. In overall character, it is a unification of the radiant Baroque tone of classic organs and the powerful, reed and aliquot voice of the ”grand jeu” of the great French symphonic instruments.